The “Blue Belle of Asia,” the world’s fourth largest faceted blue sapphire, shattered the world record for any sapphire sold at an auction, at Christie’s Geneva Magnificent Jewels Sale held on November 11, 2014 by fetching a staggering US$17.7 million, which was also the highest selling lot at the auction. According to presale estimates,the 392.52-carat, cushion-cut Ceylon sapphire was the second most expensive lot at the sale with an estimate of US$6.9 – 9.9 million. However, the enormous blue sapphire with a historical provenance dating back to 1937, outperformed the projected highest selling lot, Lot 392 – A Pair of Colored Diamond and Diamond Ear Pendants, by Bulgari – with a pre-sale estimate of US$12 – 15 million. Incidentally, this was also the first time that a blue sapphire or a colored gemstone lot had topped the sale at a public auction outperforming diamond containing lots. 1) The first time that a blue sapphire/colored gemstone lot had topped the sale at a public auction, by registering a staggering US$17.7 million. 2) Setting the world record for whole stone price for any blue sapphire/sapphire/colored gemstone, sold at an auction by registering a price of US$ 17.7 million. The previous auction record for whole stone price by blue sapphire was held by the Richelieu Sapphires set in a pair of Kashmir sapphire and diamond earrings that sold for US$8,358,520 at Sotheby’s Geneva Magnificent Jewels Sale held on November 13, 2013. 3) The highest price achieved by a Ceylon/Sri Lanka blue sapphire at a public auction. The previous record for a Sri Lanka blue sapphire sold at an auction was held by the 102.61-carat, cushion-cut Ceylon blue sapphire that sold for US$4,203,118 at Sotheby’s Hong Kong Magnificent Jewels & Jadeite Spring Sale, held on April 7, 2014. The Blue Belle of Asia discovered from the paddy fields of Pelmadulla in Ratnapura (City of Gems) district of Ceylon (Sri Lanka) in 1926, was cut and polished in Sri Lanka and sold in 1937 by the renowned Gem & Jewelry dealers based in Colombo, Sri Lanka, Messrs. O.L.M. Macan Markar & Co. Ltd. to the British Motor Magnate Lord Nuffield (1877-1963), the founder of Morris Motors Ltd. It was rumoured that the enormous sapphire was purchased with a view of presenting it to Queen Elizabeth, the Queen Mother, on her coronation day on May 12, 1937. The sapphire is set as the centerpiece of a spectacular diamond necklace, with a brilliant-cut diamond tassel pendant suspended from it. The Blue Belle of Asia topped the sale at the auction, which achieved a total sale of US$150,216,738 selling 89% by lot and 94% by value, which was almost a repeat of the astounding performance just six months earlier, on May 14, 2014, also at a Christie’s Geneva Magnificent Jewels Sale that achieved a highest total ever for a jewelry auction of US$154 million. 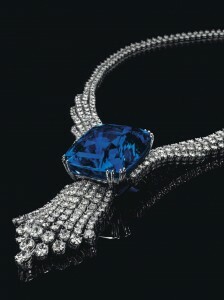 The price-per-carat value of the Blue Belle of Asia is US$44,974. The price-per-carat of the previous record holder for a Sri Lanka Blue Sapphire, the 102.61-carat cushion-cut sapphire that sold at Sotheby’s Hong Kong on April 7, 2014 for US$4,203,118 is US$40,962. Hence, in terms of price-per-carat values the price achieved by the Blue Belle of Asia is totally in keeping with the market value of enormous Ceylon blue sapphires of approximately US$40,000. I have an Australian sapphire from the fields in Far North Queensland and I would like to sell it. I had it from a piece of stone and had it cut and polished in Melbourne. I will put the following details for your information:1.21 ct. Medium dark moderate blue. 7.09 x 4.92 x 3.46mm.